Heritagem presents:This watch is from the Cape Cod Collection. It is the small model: 23x23 mm. It has an opaline-silvered dial with a quartz movement. 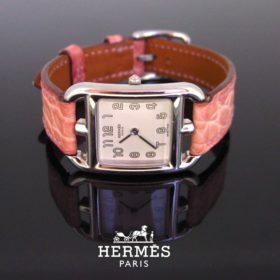 The strap is in pink alligator, signed Hermès. Made in Switzerland. The case is in very good condition. Heritagem presents:This whimsical pendant features a friendly clown with a crystal case body containing a brilliant cut diamond, floating in the case. Its hands and feet move. It is signed Chopard on the back and on the front glass. It comes with its chain, which is also signed. Numbers have disappeared with the time. The pendant presents very few traces of wear, however it is in very good condition.All our items come with either a gemmological report or a jewellery report with circa and all useful information. 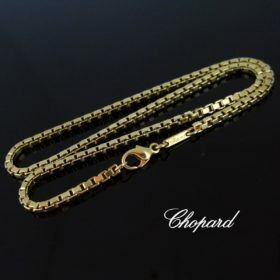 This elegant chain is made in 18kt yellow gold, it weighs 33,4gr. 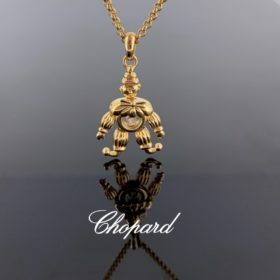 It is signed “Chopard” in its beautiful font next to the clasp. It is very easy to wear everyday. Heritagem presents:This beautiful ring comes directly from the Edwardian era. The band is made in 18kt yellow gold and the diamonds are set in platinum. 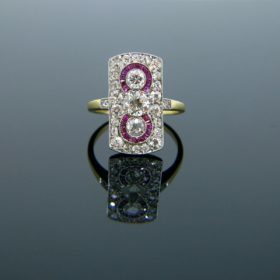 The ring is rectangular with 3 main old mine cut diamonds with the centre one weighing 0.50ct and the two adjacent ones 0.40ct each approximately. Two of the diamonds are then surrounded by calibrated Burmese no heat rubies. The rest of the face of the ring is set with single cut and old mine cut diamonds for a total carat weight of around 0.7ct. It is such a beautiful ring. All our items come with either a gemological report or a jewelry report with circa and all useful information. 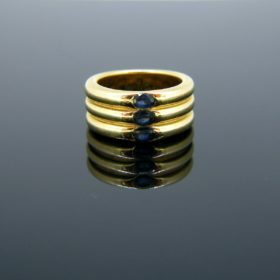 Heritagem presents:This Cartier ring is fully made in 18kt yellow gold. It features 3 oval cut sapphires with a total carat weight of 0.75ct approximately organised in a triple stack band. It is signed and numbered inside the band. 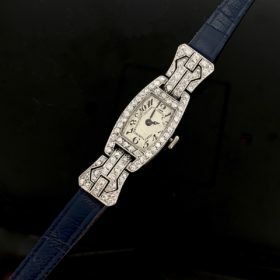 Heritagem presents:This timeless wristwatch fully made in platinum and it comes directly from the Art Deco era. It is adorned with single cut diamonds with a total carat weight of 1.40ct approximately. The watch is an automatic one and works perfectly. It was also nicely engraved on the rim. It was controlled with the Mascaron, the French hallmark for platinum. 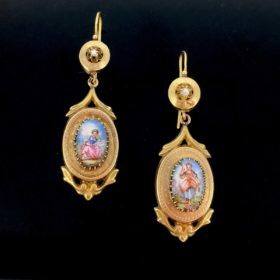 Heritagem presents:These Victorian earrings are just ravishing. They are genuine from the Victorian era in France. The centre is set with 2 oval enamel plaques, depicting a pastoral scene: two countryside’s women. The enamel is in very good condition. The top is adorned with a seed pearl. The hooks are controlled with the French hallmark: the horse’s head, used in France between 1838 to 1911. Starting with the 18th century, we go through history’s most important periods of jewellery styles, their most popular pieces and motifs and the social, political, and economic climate that influenced the era’s jewellery designs. Heritagem presents :A genuine piece from Gucci Jewellery. This beautiful bangle cuff is made in 18kt yellow gold. A large plaque of onyx is set on the top and adorned with the 2 G in the middle. There is an approximate total carat weight of 1,70ct. The bracelet was controlled with the Swiss and Italian hallmarks and signed Gucci Made in Italy on the back.All our items come with either a gemological report or a jewellery report with circa and all useful information. 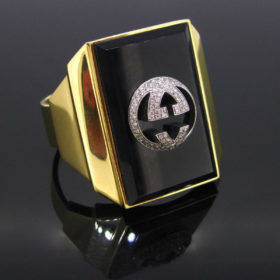 This ring is signed by the famous designer house Hermes. 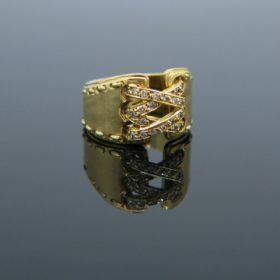 It is called the corset ring and is made in 18kt yellow gold. This modern ring features a stitch design on the both sides of the band. It is set with 28 round cut diamonds with a total carat weight of approximately 0.20ct. It is signed inside the band Hermes 52 and the serial number. All our items come with either a gemmological report or a jewellery report with circa and all useful information. This Jager LeCoultre watch is fully made in 18kt white gold. The case is square and set with 20 round cut diamonds with very good colour and clarity. It is numbered 1063344 on the back. It is a manual wind wristwatch. It is in very good condition. The bracelet has a very nice feel. The clasp is a double security buckle. All our items come with either a gemological report or a jewelry report with circa and all useful information. 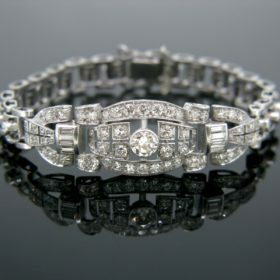 This beautiful bracelet comes directly from the Art Deco era. It is fully made in 18kt white gold and platinum. 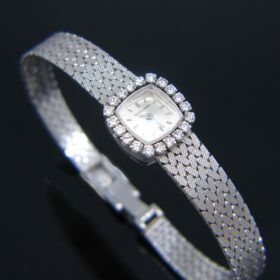 It features 118 diamonds – 110 are old European cut and 8 are baguettes. The centre diamond weighs 0.60ct approximately and the total carat weight for the other diamonds is around 2.60ct. It is a truly beautiful bracelet. It can be adjusted to shorten it if need be by removing some links.All our items come with either a gemmological report or a jewellery report with circa and all useful information. 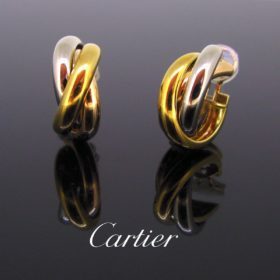 Heritagem presents:This timeless earrings comprises of 3 hoops : one rose, one yellow and one white, all in 18kt gold. The back is numbered and it is signed inside the rose gold hoop. 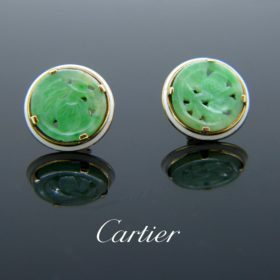 The earrings comes with its original box.Louis Cartier created the Trinity collection in 1924 for his friend the famous French poet Jean Cocteau. The rose gold symbolizes love, yellow gold is loyalty and fidelity, white gold is friendship.All our items come with either a gemmological report or a jewellery report with circa and all useful information. Estate jewelry may come from any time period, however the most popular are Georgian, Early Victorian, Mid-Victorian, Late Victorian, Arts and Crafts Era, Edwardian, Art Nouveau, Art Deco, Retro..
Jewellery by contemporary painters and sculptors. Discover the beauty of some of the more unusual gemstones. WOULD YOU LIKE a Chrysoberyl Cat’s Eye ring? ARE YOU A TIGER EYE’S LOVERS ? Every step of the process for purchasing this beautiful ring was easy. I was really anxious spending substantial money on a ring that I could not hold or try on but Camille dealt with all of my questions quickly and throughly. Oh, and shipment to the US was unbelievably quick. I fell in love the first time I saw the ring, and what I discovered was it's much more beautiful in person. Camille, of Heritagem was great, she was very easy to communicate with, shipping was painless, no waiting around for it. I will definitely be back to her shop for my next purchase. And the shipping was very fast, no problems at all. An absolutely stunning piece. I am so lucky to be able to add it to my collection. It is a substantial weight, and was given at an unbeatable price. Shipped quickly and securely from the UK to the US. It even came with detailed paperwork. I would definitely shop here again. Thank you! Heritagem, again great service I purchased my item on a Friday and had it by the following week. I love it, it's a great little brooch and clock set, I am always surprised how jewellery from the 1850's is in such great shape. Camille was really great and I look forward to doing business with her again in the future. UNBELIEVABLY GORGEOUS RING! I feel blessed to find this gem;)... Great transaction, highly recommended seller! Thank You!